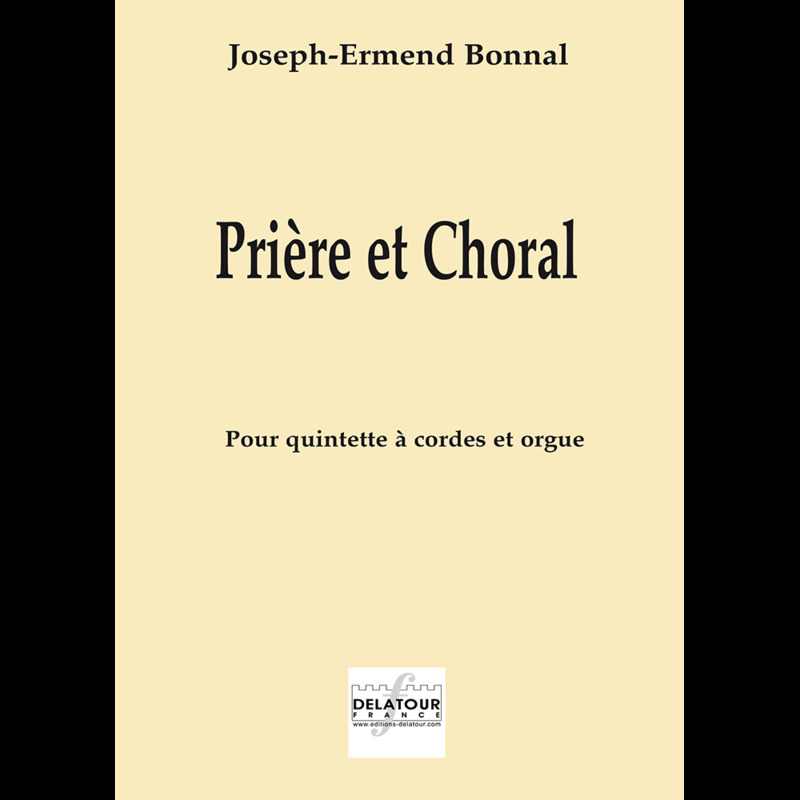 Ermend Bonnal composed Prière et chorale in 1908 in memory of his friend, the organist-composer Samuel Rousseau, who died in 1904. Rousseau had been a pupil of César Franck and choirmaster of his teacher's own church of Sainte-Clotilde in Paris from 1879. Bonnal himself was to follow in this lineage with his appointment as Organist of the church in 1942. Prière et chorale is stylistically close to Franck, who was a dominant influence also on Rousseau's compositions. It contrasts two thematic elements, the prayer and chorale of the title. The prayer begins in F major with a gently syncopated melody richly scored for organ doubling the strings. The simple harmony of the opening becomes increasingly chromatic as the theme develops. A transition in the bass instruments leads to the first chorale section, in A minor. The organ plays the theme of modal chords in the treble register; its phrases are punctuated by supplicatory rising statements in the cello and organ left hand. A development of the prayer follows, passing from A major into C major, ceding again to the chorale, now in E major. Its texture is inverted here, with the chordal theme in the organ's lower register and the supplicatory phrases descending in the violin. 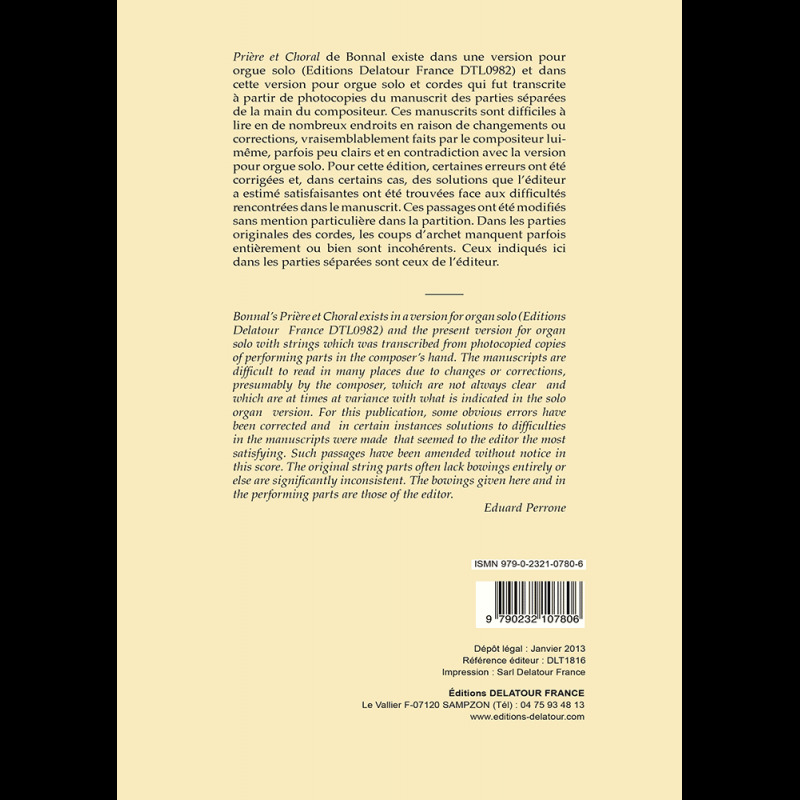 It builds to a richly scored climax back in A minor, and as this dies down, the prayer returns, effecting a retransition to F major and a full restatement of the opening section, modified to include a characteristically Franckian canonic treatment. The chorale returns in a brief coda that establishes a link between its rising phrases and the melody of the prayer.